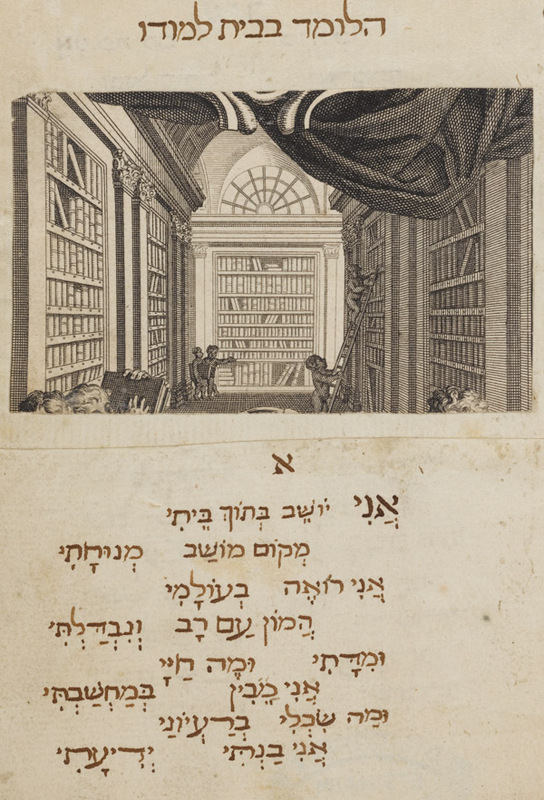 Dutch poem with Portuguese, Spanish and Hebrew translations by Isaac Cohen Belinfante. Louvor / a hum sujeito Sabio & Estudioso / que / largando as delicias Mun-/ danas / Se applica ao Estudo das Scien / cias / E debaixo de seu retrato estão com-/ postos estes versos na lingua Hollandeza / & de novo por sua Ellegancia & bom / conceito / Traduzido assim em Hebrayco / Como no Espanhol / postos tambem em verso, não alte-/ rando de seu proprio sentido, na / Traducção. Poem by Isaac Cohen Belinfante on a wise man who had renounced the worldly pleasures to devote his life to science. The text was published as a broadsheet in Amsterdam in 1764. Text in Dutch with Hebrew and Spanish translations, title in Portuguese / Paper / 16,4 x 10,6 cm. /  ff. (last 2 ff. blank) / Square vocalized characters and current writing (autogr.). Fuks 294. Fundação Calouste Gulbenkian.